Edible Wild Food Blog » Pruning Forsythia but Save the Blossoms! Those beautiful forsythia ornamental bushes are not just another bush. The brilliant yellow forsythia bush can grow to 3 metres (10’) tall and can get as wide as 3.5 metres (12’). It has a growing speed of 30 to 60 cm (1 to 2′) per year. The flowers have four lobes and appear mostly in clusters of two to six. Forsythia bark is yellowish brown in colour and has raised lenticels (bumps). It is in the Oleacaeae family and originates from Eastern Europe and Asia. Forsythia (Forsythia intermedia) was named after the British royal gardener William Forsyth (1737-1804) who brought the forsythia to England from China. The most common components in Chinese herbal formulas for treating the common cold, influenza, and allergies is the forsythia fruit. With at least three thousand years of use and documentation, it is traditionally considered a detoxicant for treating so-called “toxic” and “hot” conditions. These conditions correlate with modern inflammatory and infectious diseases, including viral and bacterial infections, as well as allergies. The properties and uses of forsythia fruit now appear to have considerable scientific support. Forsythia fruit is used in Chinese medications as it contains several properties. It is a proven diuretic; skin tonic; emmenagogue (herbs which stimulate blood flow in the pelvic area and uterus); antiscrofulous (scrofula is a tuberculous infection of the skin on the neck); febrifuge (reduces fever); and it is a vermifuge (expels intestinal worms). It is most commonly used in Chinese medicine for colds, bronchitis, strep throat and it clears the body of toxic heat (sore throats, fever, chills, chronic skin eruptions, acne or dermatitis. Be careful though, like all herbal medicines they are to be used only after seeking the advice from a qualified health professional. 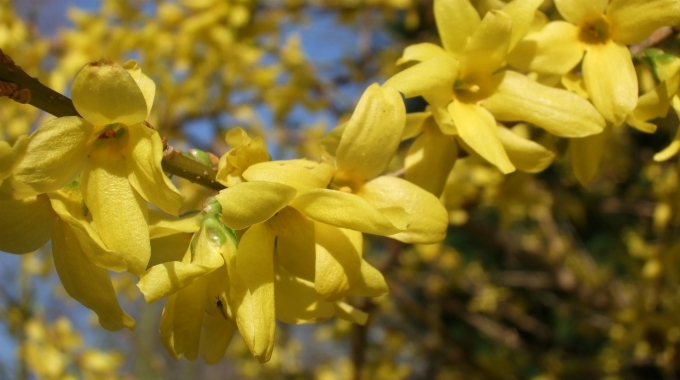 Extracts of forsythia fruit are now used in numerous types of cosmetic products, including hair care (e.g., hair growth liniments and anti-dandruff shampoos), skin care (e.g., acne cream) and foot care (e.g., athlete’s foot) products for their antimicrobial and traditional detoxifying properties. These beautiful flowers can be steamed and dried, used in decoctions and infusions, and made as a tea. In addition, tossing a few of these springtime beauties on a salad will impress any guest. If you collect 750 ml (three cups) of these flowers, you can transform them into syrup! Here is an easy recipe for forsythia syrup. The forsythia gives us another reason to enjoy springtime foraging! So next time you’re out there pruning the forsythia bush, save the flowers – you’ll be glad you did! Could hardly find blog that sfpiceies on plants suitable for our Malaysian climate. So I thought since I have the resources, might as well share it with others who would like to know about our herbs and tropical plants. Starfruit trees grow in Malaysia and they have beautiful blossums. Also, you can have a fantastic bog garden in a wide, shallow container including many carnivorous plants, even American ones like Venus fly traps. The sundews and butterworts make pretty flowers, though some times you can get a fly trap to flower too. Takes no maintenance, just put it outside. Weather conditions may be a factor – too much moisture may have created a type of fungus that prevented it from blooming. Have you noticed if other forsythia bushes in the area have bloomed? Love this! I just received a Forsythia as a gift so I am excited to try some of these ideas out. Love this website! I see nothing on the side effects of using this plant or the specific species that should be used? Love love love the Forsythia, I have one and it’s the first to bloom in my yard every year.. I know that Spring is here. Always beautiful !! When pruning,you can put a stem down into the ground , water it; and in no time, you will have a new sprout !! I live on the island of Maui Hi.I know that we have strict rules about planting anything that is not endemic to the island’s So it’s too bad that I have the climate and I am unable to plant nor even get access to seeds or cuttings of this beautiful and useful in so many ways naturally, and medically. Year after year, only the branches near the warm door bloom in my climate. This year the winter was mild for Montana, never getting down to -20°F, and the whole forsythia bloomed gloriously. Hi there, is there a difference in Forsythia fruit PE and Forsythia Vahl flower extract (Forsythia suspensa [Thunb.] Vahl)? ?